Outdoor Inflatable water slides have made life a lot easier on parents and more children can even be enjoyed by them. This is because the inflatables can be set up almost anywhere for as long as there is a flat ground.The inflatable slides come in many sizes, and the medium and large slides even allow parents to play with their children.For children, the joy of slides is playing with their parents. Using these outdoor inflatable water slides comes with many benefits and advantages. 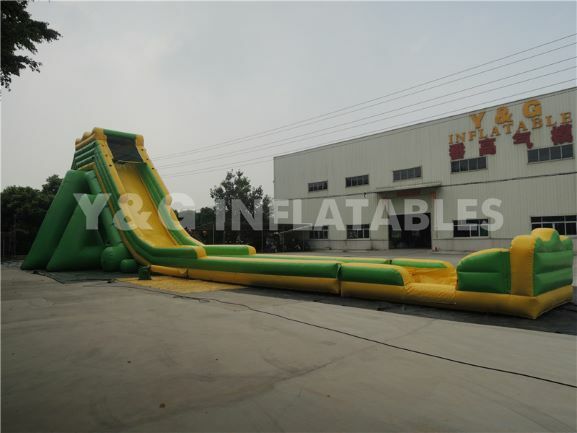 All you need to do is find flat ground for seting up outdoor inflatable water slides . They can be set up in the playground, swimmingpool, or in a garden, all depending on their sizes and needs. All the other equipment needed to set this up are included in the package.This included the pumps and the inflatable canvas. You however need a constant water supply, though you can still recycle already used water for as long as it is clean.And you’ll get the help of a professional from our company to set it up. They’ll manage the inflatable, keeping it running, and you just have to worry about the party and keeping your kids safe. The rubberized vinyl material is very safe for children in that it cannot lead to any serious harm even if one is banged on the floor or sides. It means that your child can play and laugh without getting hurt, especially if they’re pushing or being pushed by other children, as kids often do. Buying an inflatables is much cheaper and affordable as compared to constructing a water slide or a swimming pool. The inflatable doesn`t take much space as much as a tradional slides, especially as it can be taken down to free up that space again once it’s no longer in use.Then convert it to a outdoor inflatable water slides when the children need it.